The Sustainable Development Goals (SDGs) have been with us for well over two years, and now in our third year of action, my most recent blog looked at whether Scotland is moving towards a National Implementation Plan for the Goals. It’s been some time since the First Minister pledged that Scotland would be one of the first countries in the world to sign up to the global framework and with it a commitment to being ‘a confident, outward looking nation’ as mentioned in the current Programme for Scotland. It’s been a slow start, but we are now seeing big steps by businesses, third sector organisations, schools and academia across Scotland to embrace this unique agenda. What’s been needed, however, is the Government taking on a central enabling role. That’s why the revised National Outcomes laid before the Scottish Parliament by Scottish Ministers last week are so important. It’s the first real sign of movement. 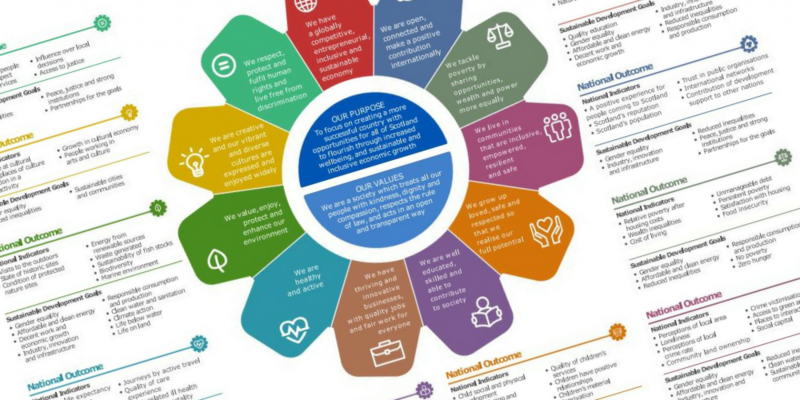 The Scottish Government committed to aligning the current National Performance Framework (NPF), of which the National Outcomes are a part, with the SDGs in Scotland’s first Open Government Partnership National Action Plan. The Government will be measuring progress towards the SDGs through its revised NPF. Whether you know much about the SDGs or not, the NPF matters to Scotland’s third sector. 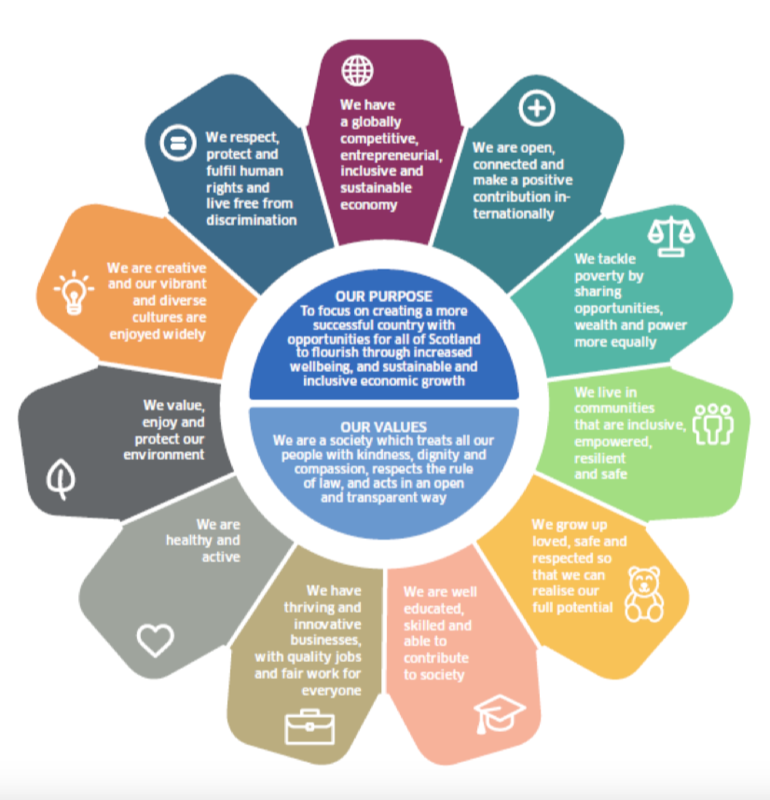 It sets out the Scottish Government’s overarching purpose and the indicators that show how the Government is performing against Outcomes that cover economic, health, social and environmental areas – areas that connect with your work. Under the Community Empowerment (Scotland) Act 2015, the Scottish Parliament now has 40 days to consider and give its views on the proposed revisions, with the period from 31 March until 15 April not counting as a result of the current recess. Parliament’s Local Government and Communities (LGC) Committee is the lead committee for this inquiryand has written to other committees to collate their views and publish these alongside their own. The timetable for parliamentary scrutiny of the revised National Outcomes is tight, with 4 May the deadline for responses from all committees to the LGC Committee. The report will be signed off by 9 May and there will be a debate in the Scottish Parliament w/c 21 May. The Convener of the LGC has asked other committees to respond on whether the revised National Outcomes relevant to their remit have changed, whether these changes are appropriate and whether the consultation exercise carried out by the Scottish Government was sufficient. If time allows, they ‘may also wish to touch upon wider issues,’ including whether the SDGs have been fully incorporated into the National Outcomes to ensure they are fully implemented, and whether the changes will allow for policy coherence between the National Outcomes, National Indicators and the SDGs. These questions are significant for both Scotland’s Sustainable Development Goals Network and Open Government Network. We will provide updates on the intended scrutiny by other Scottish Parliament Committees. You can find the full consultation document on the Committee’s webpage and you can get in touch with the LGC Committee on the three outcomes it is responsible for via Twitter or email.